Antoine Laurain writes perfectly pleasant novels. And his latest, The Red Notebook, sticks to that amiable formula which seems to have brought him some success in the past. The President’s Hat was the story of a man who mistakenly switches hats with French President François Mitterrand. It changes his life. And then he, too, loses the hat. The books is structured around his frantic search to find it again. The hat passes through a string of characters – changing all their lives for the better during the period they posses it – before eventually, serendipitously, finding its way back to Mitterand. None of the characters are in any way disagreeable, though one is interestingly curmudgeonly. Even Mitterand is portrayed as genial and sympathetic, appearing like a benevolent fairy godfather in the final chapters. 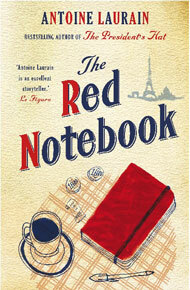 The Red Notebook takes its name from another lost object. A woman is mugged and her purse left behind by the assailant on top of a trash bin. Laurent Letellier, a divorced middle-aged bookseller, finds the bag and goes through the contents looking for information that will help him to return it to the proper owner. Instead he discovers a red notebook and very little else. He becomes intrigued by the women who recorded her thoughts on the pages (obsession would be too powerful an emotion for a Laurain character). He sets out to find her. In the place of Mitterand, the French poet Modiano steps in to provide a cameo appearance. Modiano is remarkably accommodating when Laurent approaches him in the park, having discovered a link between the poet and the notebook’s owner. Antoine Laurain writes characters well. The protagonist, Lettelier, is attractively disheveled. His teen daughter spoiled, but wonderfully vibrant. The heroine a brooding version of Juliette Binoche. Even the employees at Lettelier’s bookshop are convincingly realized. And I desperately would like to believe that Modiano is exactly as Laurain portrays him – engaging, wise and utterly, delightfully pleasant. At their best Laurain’s books and characters remind me of a sitcom. Because everyone likes sitcoms. I could also compare The Red Notebook to a Rom-Com starring Meg Ryan & Tom Hanks. Or a less successful version of Laurence Cossé ‘s A Novel Bookstore. Or even one of Alexander McCall Smith’s many, many books – without the mystery and tongue-in-cheek sense of humor. The Red Notebook (and The President’s Hat, for that matter) relies heavily on character and formula, without injecting any real conflict or originality into the narrative. It reminds me of too many other things: other books, films, television shows. But I can’t imagine three months from now saying – this (story or thing) reminds me of an Antoine Laurain novel. They, the books, lack the qualities which make a story memorable. Which is the problem that comes with pleasant. The Thorn and the Blossom is, first off, a beautiful book. It comes with a slipcase decorated in a William Morris style illustration. The book itself, an accordion book, can be opened from either side and contains four illustrations (I believe done on scratchboard) by Scott McKowen. Theodora Goss has made the most of the format by creating a romantic tale told from the perspectives of two separate characters: Evelyn & Brendan. Each cover carries one of the lovers’ initials which corresponds with the text you’re about to read: B for Brendan and E for Evelyn. It’s all very nicely done. (Warning! Skip this paragraph if you want to avoid spoilers!) Evelyn & Brendan first meet when Evelyn visits Cornwall on holiday. They have a whirlwind romance, and then separate under tense circumstances. Years later they find each other again. Intertwined with their story is a variation of the old Arthurian legend of Gawain & the Green Knight. The implication being that these two characters are reincarnations of the lovers from the old tale, cursed to be apart for 1000 years. Theodora Goss touches briefly on several of the directions she could have taken this story – but never really follows through on any of them. There’s the obvious fantasy path. Or my personal favorite: whether Evelyn’s visions (which she’s been having since she was a small child) are memories of her past life or hallucinations requiring medication. The Thorn and the Blossom is a short book, and both character’s stories combined clock in at under 100 pages. So Goss doesn’t have much space to elaborate or develop these ideas. And therein lies the rub. Because of the parameters the format forces on the author (Goss was specifically asked to write an accordion book, rather than an existing story being adapted), The Thorn and The Blossom feels oddly incomplete. As if we’ve been given the armature on which the author intended to build her plot. Goss implies that this was her intention – to leave blanks for the reader to fill in and create an even greater interactive experience. While I admire the intent, in execution the plot just felt like it was full of holes. Despite this, the story is unusual and Goss still manages to take it in unexpected directions. In addition to the psychological implications, I particularly enjoyed how the ending resolves itself only after you’ve read both Brendan’s and Evelyn’s parts. And as a package it’s wonderful. Like everything Quirk does The Thorn and The Blossom is innovative and provocative in its possibilities. I only wish they’d given themselves, and Theodora Goss, a little more space in which to explore those possibilities. 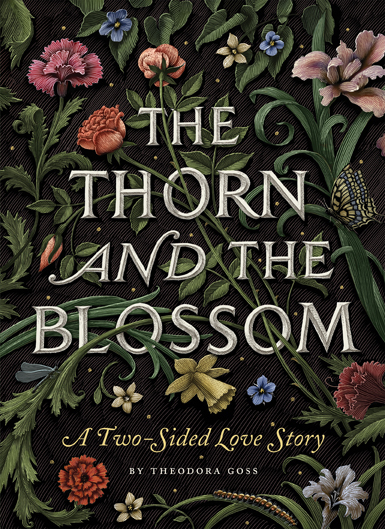 The Thorn and The Blossom is available for pre-order, release date January 17, 2012. Andrew Kaufman writes strange and wonderful books. His first novel, All My Friends Are Superheroes, features an invisible hero. To save his marriage he must convince his super-heroine wife that he is still there, sitting next to her on a flight to Vancouver. And he has to do it before the plane lands. That book has become something of a cult hit, and this latest novel is equally inventive. The Waterproof Bible is another charming love story that manages to be funny, amusing and touching in all the right places. What the plot might lack in suspense and action, it more than makes up for with a group of characters who shine. Rebecca projects her emotions. Her feelings are an open book to those around her, and the stronger they are the farther they travel. At a young age she discovered that she can contain these emotions within everyday objects. The result is E-Z Self Storage Unit #207, where her entire emotional life is organized inside of hundreds of clearly labeled cardboard boxes. Lewis is Rebecca’s brother-in-law. His wife Lisa (Rebecca’s sister) has just died. Wrapped in grief he impulsively decides not to attend Lisa’s funeral, hops on a plane and checks into a hotel in Winnepeg, Canada. There he meets a strange, and strangely horrible, woman who claims to be God. And he sorta’ believes her. Aby lives under water. She’s green, has gills, and belongs to an amphibious species closely related to humans. She can breath both on land and underwater, but as a devout Aquatic she has never left the ocean. Until now. Her mother chose an “unwatered” life when Aby was a small child. But to die with air in your lungs is a sin in the Aquatic faith – and so Aby is breathing air, has stolen a white Honda Civic and is headed for Morris, Manitoba in order to save her mother from herself. Stewart is Rebecca’s ex. He’s building a boat in the middle of the Canadian prairie. He doesn’t really know why. Neither do we. All these individual journeys are interconnected, steadily moving towards one huge moment of redemption and clarity. 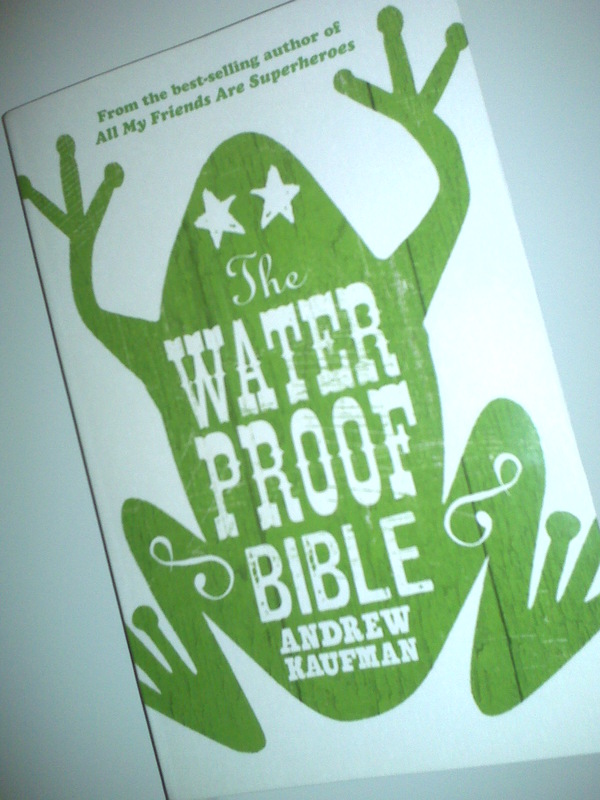 There is a quality to The Waterproof Bible that reminds me of fairy tales I read when I was younger. Like the stories in Andrew Lang’s Fairy Books, the plot is whimsical without being cloying. Entertaining while barely raising the reader’s heart rate (a talent Kaufman shares with the author Alexander McCall Smith). Add to the mix the fact that there is no overt lesson or “meaning” to bog things down, and you’re left with a book I believe most readers will quietly enjoy, then pass along to a friend. Note: There is a catch, of course. There’s always a catch. If you’re in the U.S. and want a copy of The Waterproof Bible then you’ll have to work a bit harder for it. Telegram publishes the book in the UK and Random House has it in Canada. But, hard as I searched, I couldn’t find a publisher in the states. If someone knows of one that I missed, please let me know.